A young woman is writing at a table. Her left arm rests on a clavichord. She holds writing utensils in her right hand. Her gaze rests on the paper. Her hair is tied together with a red band. The clothing consists of several layers. Red sleeves protrude under a fur jacket. Her dress is dark in color. A lace edge of the shirt protrudes above it. the background shows the shadow of her figure. Thematically, the work fits seamlessly into the oeuvre of the master of the female Half-lengths. Many variations on the theme of a female half-figure in a home environment have been attributed to this master. Remarkably often this painter used the motif of the garment with the rectangular cut-out and the hair band that binds the hair together. Although there are several variations of many works by the master of the female Half-lengths, no second version of this painting is known. The so-called Master of the female Half-lengths must have been very popular in his own time. The Master of the female Half-lengths can better be seen as a studio or group of artists who all used the same style and theme. It certainly has not been one master. Although this group of painters was very successful in their own time, little is known about what we might better call the Masters of the Female Half-lengths. Experts have been speculating about both place and period of activity for more than a century. The region of origin is also unclear. Antwerp, Mechelen, Bruges and the French court are frequently mentioned. The period of activity has been set quite broadly in the whole sixteenth century. Nowadays the working period is set to 1500-1530 (RKD). None of the works is dated. The group is named after the painting of a concert with three musicians (Harrach collection, Schloss Rohrau Austria). The painter of this work was the master or leader of the studio that produced a large group of thematically very related works. The studio was possibly located in Antwerp and had close contacts with Joachim Patinir because the landscapes that occur on various works are strongly related to this. However, the female figures are more reminiscent of Barent van Orley and Adriaen Isenbrant from Bruges. Also the name of Ambrosius Benson is often mentioned in connection with the motifs used. The young woman's clothing on the painting presented here was in any case highly fashionable in the Flanders of the 1520-1530. 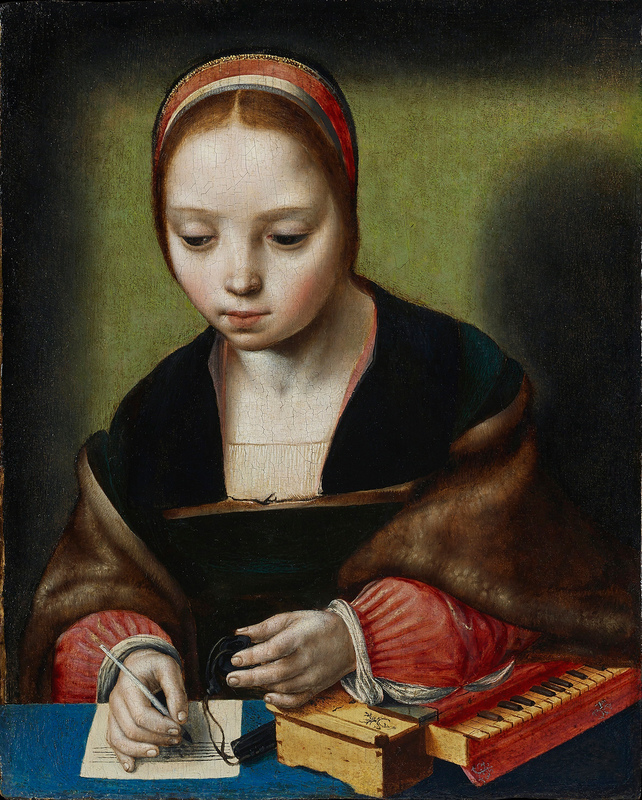 Both Ambrosius Benson and Joos van Cleve used a similar combination in a woman's portrait. See for example the painting by Van Cleve in Kassel or the portrait of Anna Stafford or Hastings in Saint Louis by Benson. Many of the female Half-lengths from this group are often called Magdalena because of the prominent ointment jar. 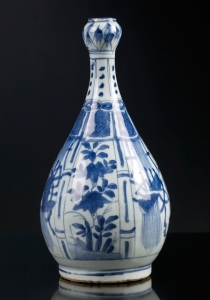 The lack of this pot makes a possible interpretation of the young lady difficult. A suggestion for Cecilia was made because of the clavichord under her arm.